I believe I'm late with the review, but I want to recommend this to those who have not tasted the magical recipe of Hosseini's writing concoctions. 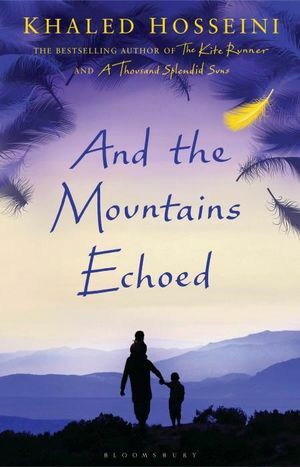 You cannot deny the fact that Khaled Hosseini is a brilliant author who knows how to mould the emotions of the reader as the story demands it. Although his books always do have a recurring pattern involving minors, pre and post turmoil Afghanistan, and an ending that leaves you neither smiling, nor crying- you never get tired of that. His sentences are interlaced with emotions; paragraphs brimming with the potency of bringing shivers down your spine, and pages encouraging you to turn to the next, even though its late at night and you've cried enough for the day. The beauty of this book lies in a few major things. One, the connectivity of lives. Chapter after chapter, you get to know about a completely different world, an entirely eccentric life, in an altogether separate geographical location, yet having a touching connection with the preceding and following chapters. So while Hosseini takes you round a tour of Shadbagh, Kabul, Paris, San Francisco, Tinos; detailing about the histories, the lifestyle- the thread of the storyline is what enables you to appreciate these places through the eyes of the person living it. Two, the hard hitting truths hidden in various narrative sentences, despite the eccentric lives of the characters. It applies to them- but it forces you to retrospect your own life, the way you were brought up, the factors that influence the decisions you take, and how those decisions change the course of the future- and no sooner you realize you have stopped reading midway and you're lost in your own world. And then you blink, and come back again to the smooth pages inked with black. I rated the book 5 on 5 stars on GoodReads. I thought for a moment whether I was being over generous. I wasn't. Five, was the least I could give. Also, if you haven't read the book, visit http://echoproject.ca/ and read along with it. You'll enjoy it. Perhaps I've grown as a reader, but I felt this book is more of thought provoking one, rather than a saddening one.